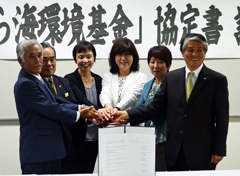 On April 2, representatives of the companies, the fishery cooperative and municipal office involved in mozuku seaweed signed the agreement to create a fund for preserving the sea environment on Kumejima Island. An agreement signing ceremony for a fund to protect Mozuku seaweed was held on April 2 at the town office on Kumejima Island. Kumejima Mayor Choko Taira, Seiji Tonaki, the president of the Kumejima Fishing Cooperative, Takayuki Kimura, the president of the seafood company, Takayo Muto, the executive director of Wakayama Citizens Co-op and Yoko Matsumoto, the vice president of Osaka Izumi Citizens Co-op took part in the ceremony. Three yen from each sale of products from Kumejima stores will go to the fund, which will be donated to the municipal office. The donations will be used for activities such as clearing rubbish that drifts ashore and planting vetiver grass to prevent red soil from flowing into the sea. Kimura, the president of the seafood company, said, “We would like to sell good quality mozuku to our customers by cooperating with the farmers.” Tonaki, the president of the fishing cooperative, said, “We are striving to farm the seaweed responsibly.” Taisuku Endo, the group leader who is responsible for natural mozuku at the cooperative, promised stable supply of the product.